Over the past few years, early childhood education has become the holy grail for those seeking to improve America’s schools and, with them, the life prospects of disadvantaged kids. Endless reams of research studies show that the famous “achievement gaps” between low-income and middle-class students emerge before they reach first grade. And the work of Nobel Prize–winning economist James Heckman suggests that investments in high-quality pre-K produce as much as $6.30 in return for every dollar spent. At the same time that expert consensus is solidifying around the importance of excellent preschool instruction, many are insisting that the time has come to fully professionalize a field that has traditionally welcomed job seekers lacking a higher education. Last year, the District of Columbia issued a requirement for all childcare workers to achieve at least an associate’s degree by 2020. In 2014, a committee of experts convened by the National Academies of Sciences, Engineering, and Medicine went even further, recommending that all lead teachers working with young children graduate from a bachelor’s program. With a growing number of states embracing the idea of universal, publicly funded pre-K, and multiple signs indicating a move toward more stringent professional requirements, New America and Bellwether Education Partners have released a report projecting what the transition could look like. The main takeaway: The urge to lift standards for those working with small children is on a collision course with the paltry compensation those teachers currently receive for their labors. The paper collects observations and advice from a conference of experts on early childhood teacher preparation held last year. The group considered the growing costs of higher education — which would be borne by employees currently working at or just above the poverty line — as well as the inconsistent quality of many early childhood bachelor’s programs. Encouraging more professional credentialing without emphasizing quality or affordability could force financially stressed workers to pay thousands of dollars for a degree of dubious worth, they warn. According to a 2016 report issued jointly by the Department of Health and Human Services and the Department of Education, non-college employees working at community-based childcare centers earn a median hourly wage of between $9.00 and $9.30. That’s less than the minimum wage in a growing number of states. Meanwhile, according to the College Board, the average cost of tuition and fees at public four-year colleges has risen to nearly $10,000 annually. In eight states (Alaska, Colorado, Connecticut, Louisiana, Mississippi, Oklahoma, Virginia, and West Virginia), costs rose by 20 percent or more between the 2012–13 and 2017–18 school years. Preschool teachers differ in a number of ways from their colleagues in elementary, middle, and secondary schools. While K-12 teachers are largely female (68 percent), preschool teachers are overwhelmingly so (98 percent), and the proportion of non-white preschool teachers is more than twice as large as those in K-12 schools (37 percent versus 18 percent). 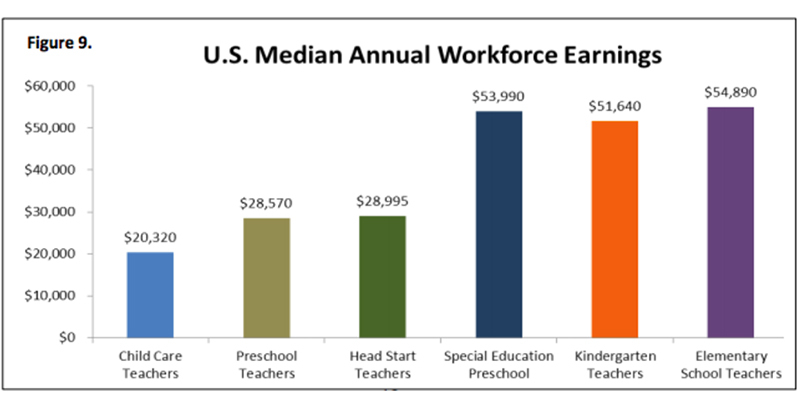 Most important of all, kindergarten and elementary teachers, almost all of whom are college-educated, earn about double what preschool teachers do. Income and employment data consistently show that workers who have completed higher education make more money and are more likely to be employed, so requiring preschool teachers to hold college degrees would undoubtedly help them make up some of that earnings gap. But it would also impose significant burdens, measured in both time and money, on the largely lower-wage, female, and minority staff who currently make up the early education workforce. In order to lift credentialing standards without leaving existing workers behind, the report advocates support for initiatives like North Carolina’s Teacher Education And Compensation Helps (T.E.A.C.H.) scholarship, which covers most of the cost of attaining an associate’s, bachelor’s, or alternative teacher credential and has been adopted in 23 states. The authors also recommend more experimentation in online degree programs that offer greater flexibility to full-time workers, as well as competency-based models that reward teachers with credit for skills they’ve already acquired in the classroom. But even if more preschool teachers can successfully (and affordably) be placed into university or certification programs, the education of young children won’t improve unless those programs actually confer some benefit to participants. The authors warn that too many colleges are happy to accept tuition money from future pre-K teachers in exchange for uneven coursework and inexperienced instructors. Kathy Glazer, president of the Virginia Early Childhood Foundation and one of the experts consulted for the report, said she believes that a straightforward bachelor’s requirement is an imprecise proxy for the competencies demanded of an early educator. “Unless and until a bachelor’s degree actually demonstrates and reflects that the candidate has acquired these skills and will be paid accordingly, I believe it is disingenuous to push the early childhood workforce, historically a low-wage workforce, toward bachelor’s degrees,” she told The 74. Among the hundreds of thousands of teachers and aides who work in publicly funded pre-K programs around the country — most famously the federal Head Start initiative — many are already graduates of four-year college programs, the authors write. Head Start itself requires that half its lead teachers working with 3- and 4-year-olds possess bachelor’s degrees (in fact, about 75 percent do), and of the 59 pre-K programs funded by various states, 35 are subject to similar mandates. 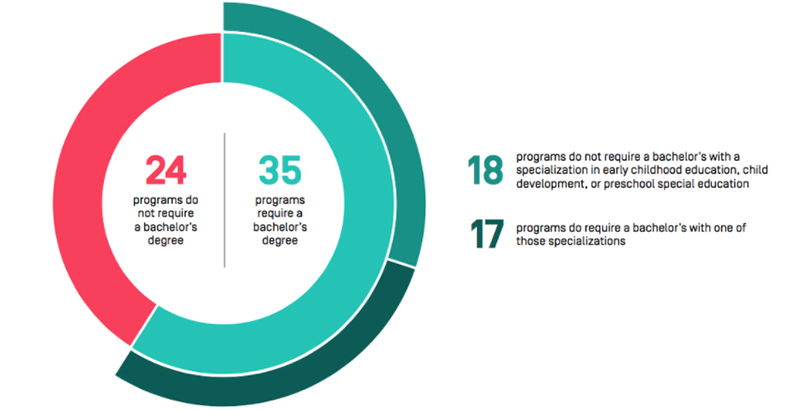 Seventeen state-funded programs, more than one-quarter of the total, further stipulate that teachers must hold a bachelor’s with a specialization in early childhood education, preschool special education, or child development. That’s an important distinction, since the available research is decidedly unclear on whether the quality of pre-K instruction is meaningfully affected by teacher educational attainment. 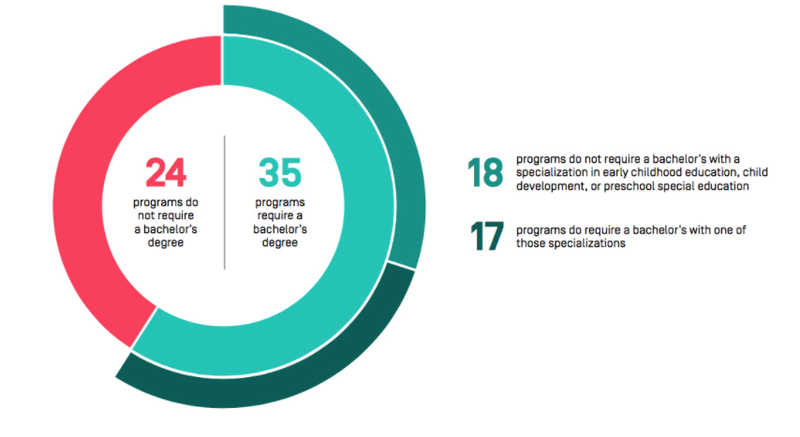 Even if a college degree improves teacher quality at the margins, it’s almost impossible to pinpoint what types of teacher preparation programs are the most beneficial, or which preschools allow college graduates to best apply the knowledge they’ve gained.